When it comes to the weather, I love wearing more of a light weight foundation since it feels like I am wearing nothing on my face, but also gives me some coverage. And that is something I love about the It Cosmetics Your Skin But Better CC Cream. Now wear I live, we still have a little snow on the ground, but it has been slowly getting warmer, so I have been reaching for this a ton. Also on top of it, it does have SPF 50+ so it helps if you are going to be out in the sun as well! 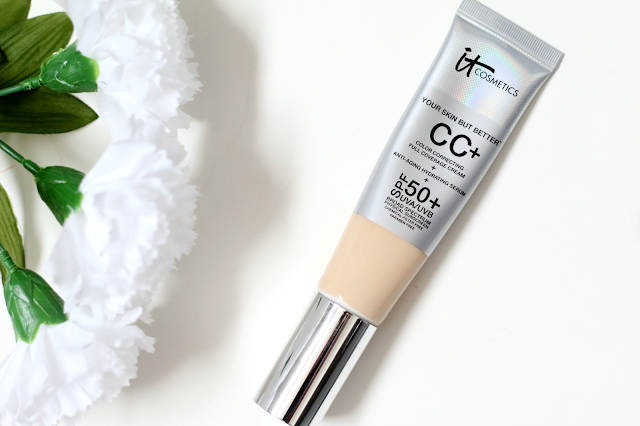 With this CC cream, it is supposed to give you a flawless look without creasing or cracking on the skin. My face is typically dry around my cheek area and where I get break outs, so I love finding a foundation that will not crack on those areas, but also stays put near my oily t-zone. I feel like this looks extremely natural on my skin and does not cake up throughout the day. So far I have worn this for the most time last weekend, which I had this on for 9 hours and by the end of the day it still looked good. I had to touch up a little on my t-zone but that is normal for me with a lot of foundations. As you can see in the before and after photos below, I do have some acne scarring. 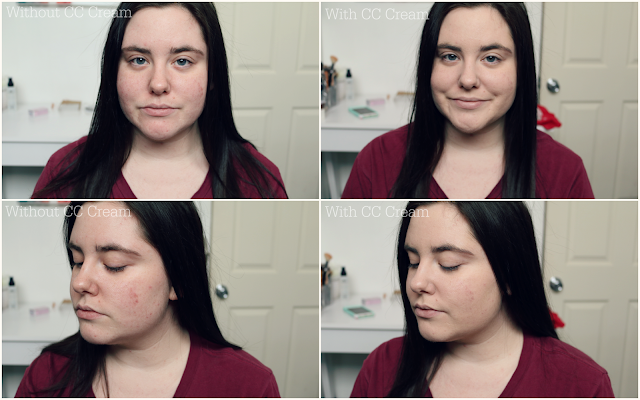 And for a CC cream I am really impressed with how well it covers. I do one coat all over, and then if I need added coverage, I will apply more on my acne scars and breakouts. For a CC cream it has amazing coverage compared to others that I have tried. Also this product does have kind of a lemon scent which I love. This will more then likely be my go to face product for the Spring and Summer. And just for comparisons I am in the shade fair. I also forgot to mention that this product comes with a pump which makes it really nice to get the product out without making a mess! You can purchase this CC Cream at www.ulta.com for $38.00.